We’re less than a year from learning whether Budapest, Paris or Los Angeles will host the 2024 Summer Olympics and Paralympics. The International Olympic Committee will pick a city next Sept. 13 at their meeting in Lima, Peru. Los Angeles, of course, has twice hosted the Summer Games in 1932 and 1984. 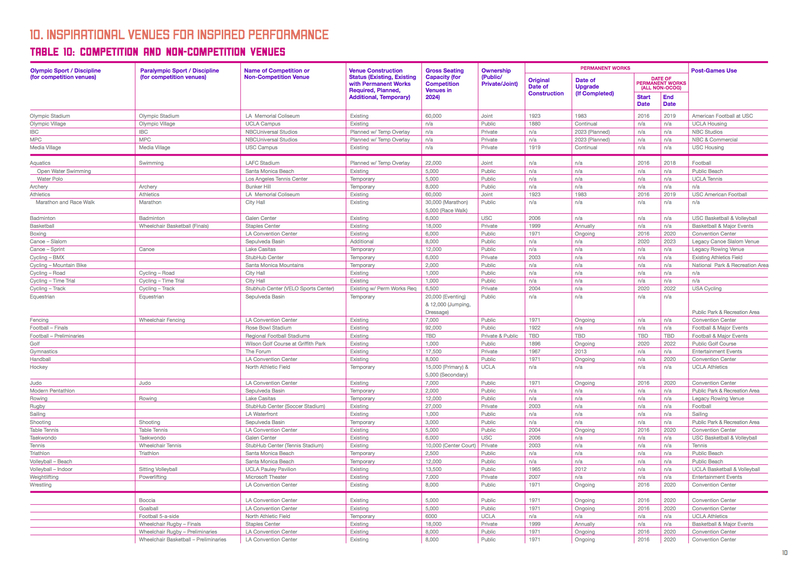 Nearly all of the venues needed for a third Games are in place. The only entirely new one needed is a canoe/kayak course in the Sepulveda Basin. I’ll be up front with my bias: I really, really want L.A. to win. Why? •I’m a sports fan and an L.A. Games is probably the only way many people — including myself — will ever get to see the Olympics and Paralympics in person. 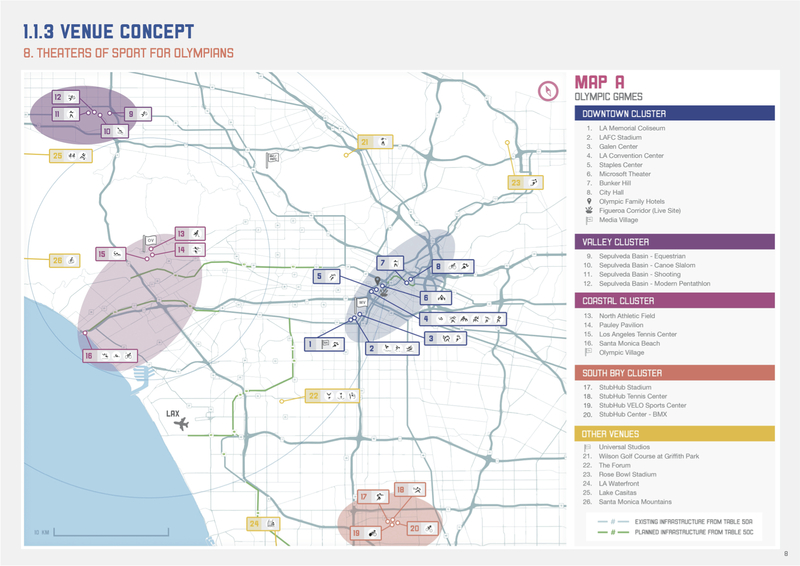 •I think hosting an Olympics would light a collective fire under L.A.’s keaster to make needed civic improvements, especially to public gathering places and DTLA. •Assuming expenses can be held in check, the Olympics could be very good for many parts of the local economy. In particular the service sector. •I don’t see transportation and traffic as an issue. At all. “Here’s the thing — the L.A. region is so big and so vast we could swallow a Summer Olympics without it really disrupting the region or causing any problems,” my colleague Jody Litvak likes to say. I agree. And I would also point out that in the past few years, our region has become increasingly accustomed to big road closures (Carmageddon/Jamzilla/CicLAvia/L.A. Marathon) and days with multiple big sporting events at different venues. We’ve survived all of them pretty much unscathed. Of course, the primary interest of this blog is transportation. So let’s take a closer look at those issues. Objective 4: To use the LA 2024 Transport Strategy as a means to accelerate changed behavior among Angelenos and encourage broader public use of LA’s rapidly evolving transport system before, during, and after the Games. The Olympic and Paralympic Games offer an incredible opportunity to shift the perception of LA’s public transport for visitors and residents alike. LA 2024 is working closely with LA transit authorities to accelerate the Metro Purple Line extension to Westwood and the Automated People Mover at LAX. This acceleration and promotion of public transit through the Games will dramatically impact the accessibility and productivity of public transit options for visitors landing at LAX, residents traveling to and from the airport, and daily commuters in need of public transit options across the City. Encouraging the use of public transit options to keep LA moving during the Games can encourage changed behaviors long after the Games. Hard to object too strenuously with any of that. The majority of events in L.A. are planned for four places: the DTLA to Exposition Park corridor, the UCLA campus in Westwood and Santa Monica; the Sepulveda Basin in the San Fernando Valley, and; the StubHub Center in Carson. Outside of the Coliseum and the big indoor arenas (Staples and the Forum) most of the venues are on the smaller side, as the chart below shows. •DTLA is already the hub of the regional transit system with a subway, three light rail lines, commuter rail, Amtrak and a multitude of buses from several transit providers. 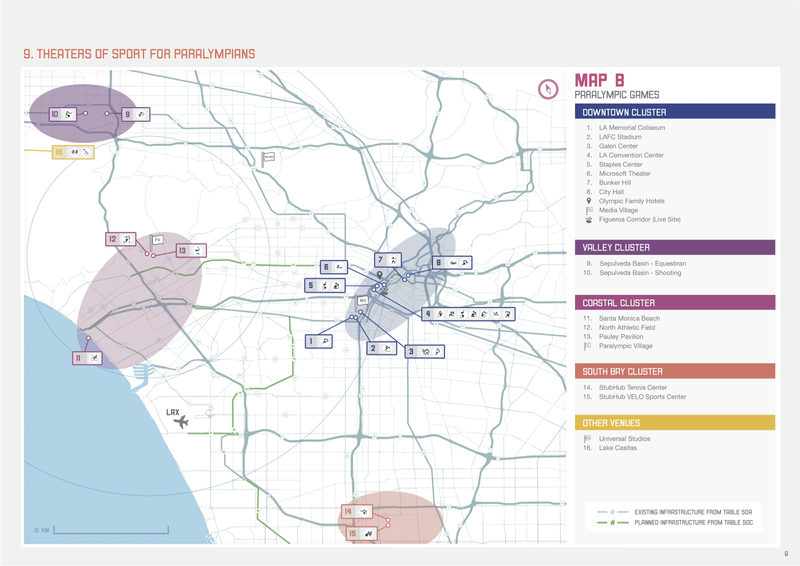 The Regional Connector — with a target completion date of 2020-21 — will tie together the Blue, Expo and Gold Lines and effectively create two light rail lines: a north-south one between Azusa and Long Beach and an east-west line between Santa Monica and East L.A.
•As for the Sepulveda Basin, the Orange Line runs along its north border, meaning it’s a fairly easy ride from DTLA — Red Line to NoHo and a transfer to the Orange Line. Both the Woodley and Balboa stations offer access to the Basin by foot or perhaps by a shuttle bus. •The StubHub Center in Carson is not directly on a rail line. But it’s relatively close to the 110 freeway and the Silver Line and 4.5 miles from the Blue Line’s Del Amo Station — the kind of distance a shuttle bus could handle. •As for the Santa Monica events, the Expo Line opened between DTLA And SaMo earlier this year. By 2024, the light rail car shortage will (hopefully) be something we barely remember and longer, very frequent service will be the norm. •Here’s the Really Big “if” of all this: Measure M, Metro’s sales tax ballot measure, includes funds to get the Purple Line Extension to Westwood by 2024 and to open the Airport Metro Connector station that will serve as the transfer point from the Crenshaw/LAX Line and Green Line to the airport’s new people mover by 2023. If Measure M fails, Metro would need to find other funds to accelerate both projects. There’s another good point Jody makes: putting aside the rail projects, the L.A. region is criss-crossed by a long list of wide boulevards and freeways that move a lot of people. Our region also has thousands of transit buses at its disposal, not to mention plenty of paint and traffic pylons. It doesn’t seem a stretch to create temporary bus lanes where needed and to include transit passes with tickets to Olympic events. The economic benefits of hosting the Olympics will almost certainly remain a controversial topic — and at times the Olympics have cost cities a lot more than they ever could hope to recover in the near- or far-term. It hasn’t been much of an issue here thus far. I think even without an Olympics, L.A. will continue headed in the right direction. I’ve gotta say: when I moved to the region in ’94, many parts of the city were not very impressive. Downtown and Hollywood were run-down, at best. A lot of the old businesses districts seemed empty. There was a stub of a rail system — that no one I knew actually used. And, yet, instead of the people of our region permanently retreating to the distant ‘burbs, many neighborhoods got rebuilt, reinvented, cleaned up and a lot more interesting — from Echo Park to Boyle Heights to NoHo to Santa Monica to Old Pasadena to many others, with new rail lines often playing a role. An Olympics would be a reward for the progress thus far — and an incentive to keep going. •This great post on the Metro Transportation Library’s Primary Resources blog has a ton of great info about the effort to serve the Games in ’84 only with buses. I’ve been here since 1980 and remember the 1984 Olympics very well. We could clearly see the fireworks of the opening and closing events from the rooftop deck on my apartment building in Beverly Hills. As you noted, the only public transit at that time was buses. The hue and cry beforehand was that traffic would be a nightmare during the Olympics — but guess what… the city implemented a plan encouraging car pooling, using the buses and modifying one’s driving to avoid or accommodate Olympic venues. And they did this by means of a vigorous very effective PR campaign alerting the driving public to every aspect of the plan. Everyone knew what was what before the first athlete arrived. The traffic plan and PR campaign worked amazingly well. Instead of the nightmare traffic everyone feared, vehicular traffic actually decreased and traffic flow improved during the Olympics. For years afterward, a common topic of conversation was “Why can’t they keep traffic moving like it did during the Olympics?” That’s how good it worked. With the growth of the Metro Light Rail system and bus lines, traffic should be even better during the 2024 Olympics!